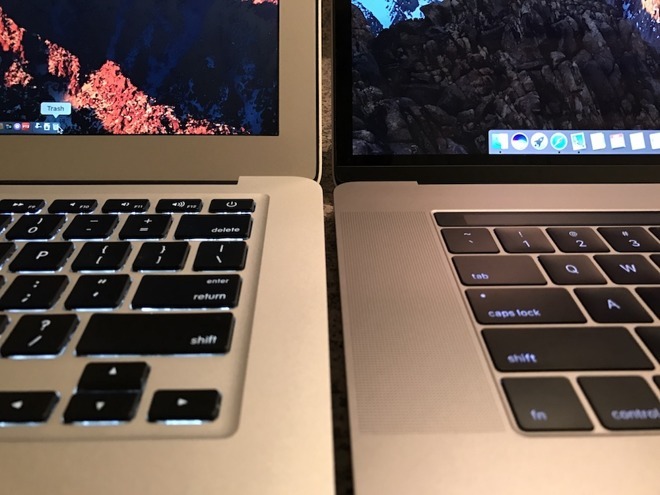 The latest MacBook Pro models are internally Apple's 13th generation MacBook Pro, but they effectively represent the fourth major body redesign. Steve Jobs introduced the first MacBook Pros at the start of 2006 as an Intel-based version of its existing aluminum shell PowerBooks, one year before the iPhone was introduced. Apple originally introduced just the 15-inch model, followed by a huge 17-inch version and smaller 13-inch model over the next year. A year after iPhone, Apple introduced MacBook Air at the beginning of 2008, the first unibody Mac design. Later that same year, the MacBook Pro line also got unibody frames. Four years later, Apple discontinued its 17-inch model and moved its MacBook Pro line to Retina Displays, representing the third major redesign. 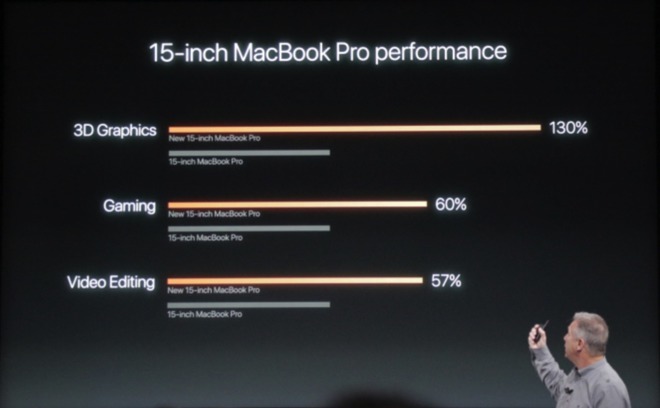 While borrowing manufacturing technology from the MacBook Air and iPad, MacBook Pro models remained a substantial 0.71 inches (18 mm) thick and the 15 inch model weighed in at 4.5 lbs (2.04 kg). In its fourth major redesign, the new 15-inch workhorse MacBook Pro slims down to 0.61 inches (15.5 mm) and now weighs just 4.02 pounds (1.83 kg). That's slightly thinner than last year's 13-inch MacBook Air and only a pound heavier, despite packing a broad range of Pro features and essentially a larger, better, faster everything. That really reinforces that Apple's design intent on the Pro end was to create a truly mobile machine more than just a transportable desktop alternative. Apple's high end 15-inch MacBook Pro is available in standard Silver and a darker Space Gray finish, and is sold alongside a smaller 13-inch version with many of the same features apart from scaled down CPU options and being limited to Intel Iris Graphics and 1TB of SSD storage. Apple also offers an entry version of the 13 inch MacBook Pro lacking a Touch Bar and Touch ID and equipped with only two Thunderbolt 3 ports. The company is also selling its ultralight 12-inch Retina MacBook powered by lower-end CPUs and with only a single USB-C (supporting only USB 3) in Silver, Space Gray, Gold and Rose Gold; it also continues to sell the former 13-inch MacBook Air, which lacks a Retina Display and uses full size USB 3 ports and Thunderbolt 2, available in Silver. While Apple emphasized the light, slim design of the new MacBook Pros at their introduction, it focused even more attention on an entirely new feature making its debut the Mac platform: the new Touch Bar and its Touch ID fingerprint sensor that takes the place of the power button. Both are controlled by a custom Apple T1 chip that pairs the efficient processor used in the Series 2 Apple Watch and Apple's Secure Enclave architecture that authenticates biometric data from modern iOS devices' Home buttons. Touch ID on the Mac, therefore, takes biometric security a lot more seriously than previous generations of Windows laptops that incorporated a fingerprint scanner. As with iOS devices, the Secure Enclave makes it impossible for third party apps or even system-compromising malware to gain any access to your fingerprint data. 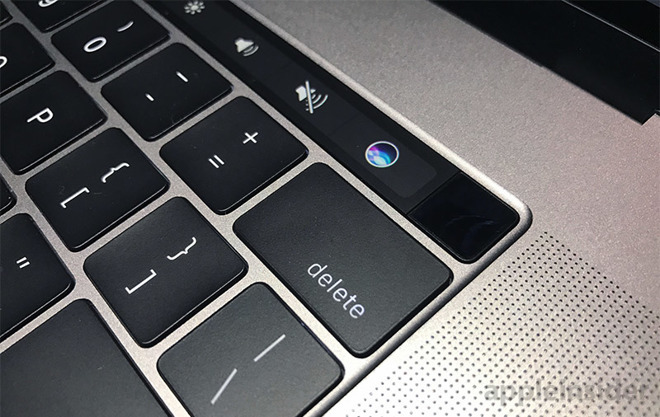 As implemented on MacBook Pros, the Touch ID sensor (below, the dark square to the right of the Siri Touch Bar button) acts as a button, but you probably won't need to use it as a button very often. The new machines automatically boot up or wake when opened (and don't even bother to play a startup chime). The button is there to perform an emergency power down in the case of a system crash. Unlike previous MacBook power buttons, pushing it no longer offers to sleep, shutdown or log out of the machine. Just close the lid to sleep. Rather than regularly logging out or shutting down, you can now associate the sensor with five different fingerprints (your own, or of other people), which can be used to wake or to switch between accounts using Fast User Switching. Note that if you log out of your account, you'll need to supply a password to log back in; Touch ID only works if your account is active. You also need to log in manually after a power cycle, just as with iOS devices. This multiple-account, multiple fingerprint behavior is likely to eventually make it to iOS devices, as they become more powerful and as multiple accounts evolve into a complete feature. So far, Apple has focused on multiple accounts only for education use. Touch ID can also be used to instantly unlock Notes you've locked with a password, or other content in third party apps making use of Apple's security Touch ID APIs. Apple indicates that locked System Preferences can also be unlocked with a finger print, but that doesn't seem to be working yet. If you have your machine set up to lock the screen after a moment of inactivity (the default behavior), you can also unlock the screen instantly with a touch. It's really, really fast and effortless. The Touch Bar is intended to appear and function as a dynamic strip of virtual keyboard keys, unconfined by the physical structure of mechanical keys. When you hold down the FN key, the Touch Bar reverts to a standard strip of 12 function keys and the ESC key (below). If you boot into Windows, the Touch Bar reverts to displaying virtual FN keys. Otherwise, the strip displays three pools of functionality: on the right end is a Control Strip of keys offering a mix of conventional alternative MacBook function keys (system volume, media playback, screen and keyboard illumination brightness, Exposé buttons and a button to invoke Siri). This strip collapses down to about a quarter of the Touch Bar in normal use, but a tap on the expansion arrow makes the Control Strip take over the entire Touch Bar (below). You revert back by tapping the close "X" button. The main portion of the Touch Bar is used by the current application to offer relevant options based on what you're doing or what you've selected. This app region commonly exposes the same kinds of buttons that you'd see in your window Toolbar (like the Mail app, below), but developers can add new controls including sliders, pickers and suggestions that wouldn't really make sense in a window Toolbar. It also serves as a way to expose functionality that would otherwise be buried in menus, requiring more mousing around to select. The layout of these app region buttons can commonly be edited from an app's View menu, using an interface similar to how you'd customize your Toolbar buttons (below: editing the Finder's Touch Bar). You simply drag the icons you want toward the Touch Bar on the main screen, and when finished tap the Done button. Another feature of the Touch Bar —which generally takes over the app region when you're typing —is similar to the QuickType keyboard of iOS. It offers completion suggestions on words you type (below, "antidisestablishmentarianism"), and is tied into the standard spell checking of macOS, enabling you to select a spelling suggestion by visually tapping on the word you intended, rather than tapping the space bar to accept the primary suggestion (which in this case would have been "antics"). This region can also suggest emojis as you type words (or, below, provide a browsable list of your frequently used emojis or present all the various buckets of emojis: smileys, animals, food, activity, places, objects, symbols, flags). The Touch Bar pickers are all much easier to use than the clumsy, existing emoji selection mechanism of macOS that relies on keyboard shortcuts and mousing around. Additionally, whenever you have a selection of options in a dialog box, those buttons generally show up in the Touch Bar for easy selection (below). Also —borrowing a page from iOS —macOS now suggests autofill information in web forms (such as suggesting your phone number, email or other contact information), and these suggestions similarly appear in the Touch Bar as buttons you can use when filling in forms. Using the Touch Bar feels novel and futuristic (think Star Trek and those glass command panels of graphics moving around). The options displayed can range from very handy to a bit overwhelming, particularly when you switch to a less familiar app and have to absorb the options it chooses to expose. There's no System Preference for turning off the Touch Bar, but it doesn't ever seem to really get distracting, even if you're inside an app where it makes less sense to use it. If the constantly changing nature of contextual buttons in the app region gets overwhelming, you can tap to expand the Control Strip and have a fixed set of static black and white buttons. And despite a report to the contrary, modifier key combinations (such as holding down Option + Shift when adjusting the volume buttons to change the setting in smaller increments) also work with the expanded Control Strip buttons in the new Touch Bar. However, without expanding the Control Strip, volume controls hide behind a single button, which when touched presents a slider control for adjusting the volume, with standard increment buttons on either end. When background music is playing in iTunes (or another app is playing video or audio), the Touch Bar presents a button that when tapped shows a progress indicator and pause, fast forward and review buttons. There's also a red button badged with the currently playing app, which can be used to bring that app forward (below). Notably, there's no indicator presented in the Touch Bar itself showing the name of the song or other content being played. However, this does offer a quick, two tap way to bring up the currently playing app so you can see what's playing. The value of the Touch Bar changes based on the app you're using. When typing Notes, it basically serves as just a QuickType suggestion field, along with buttons for basic formatting and Note management. 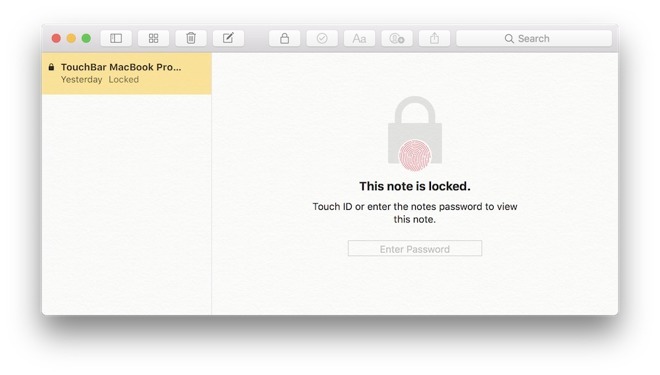 One key new features in Notes, however, is lockable Notes. Password protect a Note, and the Touch Bar directs you to authenticate with your fingerprint. Some of Apple's bundled apps present Touch Bar buttons that let you access nearly all of their basic features from the strip. For example, Maps lets you search for a variety of common items like nearby restaurants, cafes or gas stations and then get directions or look up the location's website, call it, favorite it, get more information or share it with just two taps of the Touch Bar. Even utility apps like Activity Monitor expose one-tap control to the various tabs of the display, no mousing required at all. Apple's creative apps, like Photos and Final Cut Pro, offer more specialized technical controls that expose features you'd otherwise have to mouse around to select. Photos, for example, lets you pan through your photos, tap to favorite, tap to edit, and then tap to apply a filter or adjust Light or Color, with a live preview of what it will look like. Photos is a great example of an app using the Touch Bar to present common macOS app features in a more iOS-like fashion, with direct manipulation in a simplified context where it's even more obvious what you're doing. (below, Photos in full screen mode editing an image. The same adjustment controls are presented in the Touch Bar. It's not conveyed in the screen shot, but the direct manipulation it offers is far more satisfying that trying to operate slider controls with the trackpad or a mouse). Third party apps will need to make some effort to present useful features in the Touch Bar, but a variety are already working on functionality due immediately or later this year. Apple demonstrated initial developer support for Adobe Photoshop and djay Pro, an a variety of other developers have also announced they'll be adding specialized support for Touch Bar, including Microsoft's Office and Skype apps; photo editors Affinity Photo, Sketch and Pixelmator; video editor Da Vinci Resolve; Omni's productivity suite including OmniGraffle, OmniPlan, OmniFocus and OmniOutliner; journaling tool Day One; development text editor Coda; blogging tool Blogo and interior design modeling tool Live Home 3D. However, most users don't see a touch screen PC as being very compelling or valuable, particularly after the novelty wears off. It's fatiguing and pulls your hands off the keyboard. Touch works best when its the primary interface (such as on a phone or tablet) rather than simply being layered on top of the conventional mouse-based desktop. The Touch Bar seems to do a better job of bringing iOS-style touch to conventional notebooks than making the entire screen a touch surface. Apple's Touch Bar puts multitouch controls just above the keyboard, where they remain visible even as you touch type. The more I use it, the more it seems that the dynamic —yet restrained —design of the Touch Bar offers something of real value: it's not just the ability to reach out and touch the existing display as a shortcut to selection with a pointing device. Instead, it presents a hot list of actions distilled down from the busy desktop interface. Other examples include Contacts where the Touch Bar offers big easy buttons for reaching the selected contact, with icons for calling, FaceTime or emailing. Tap the Edit button, and you get large buttons for adding a new phone number, email, birthday or address, after which you can immediately begin typing in the information. That's a quick alternative to mousing to a specific field and then returning to the keyboard or reaching out to touch small targets on a touchscreen monitor. Some of Apple's own apps have pretty basic support for the Touch Bar. In System Preferences, it would be more useful if you could edit a list of shortcuts to the Pref Panes you frequently access. Certainly, in some apps the options presented in the Touch Bar are little more than a novelty and at the very worst a distraction. However, there are useful shortcuts throughout even the bundled macOS apps, and the Pro apps Apple has demonstrated so far appear to make smart application of the Touch Bar--in conjunction with the trackpad--in ways that promise to save veteran users a lot of time when doing precise or repetitive tasks. Apple's guidelines seek to keep the Touch Bar uncluttered and easy to use, with generally minimal use of colorful graphics and animations outside of sliding controls in-and-out of focus and representation of screen content or editing results. Touching control buttons and using sliders and other features of the Touch Bar feels fast and fluid. 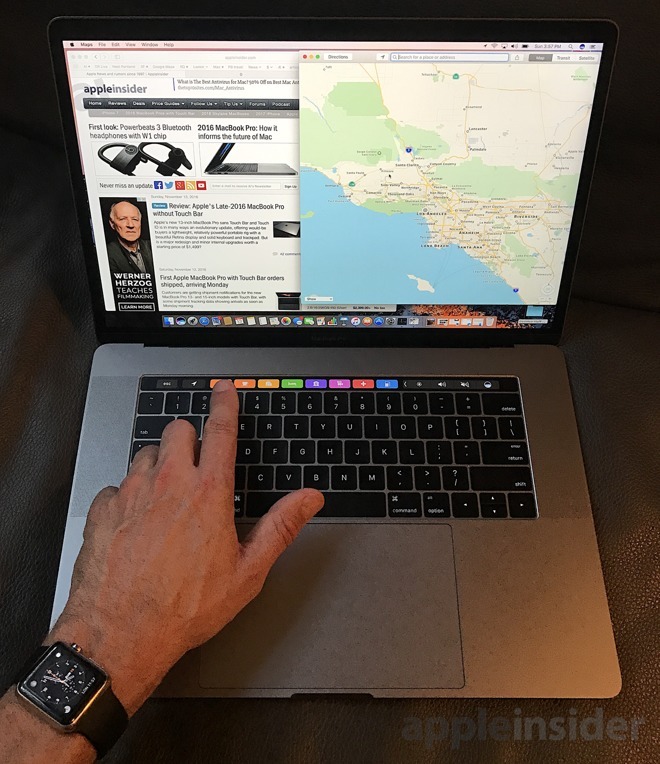 It's also noteworthy that Apple's own implementation of the Touch Bar is far more sophisticated and useful than what was imagined in rumors this summer, where the display strip was portrayed as simply being a copy of the menu bar icons, and portrayed duplicative visualizations of on-screen progress bars and Siri animations, offering very little value to users. In addition to a new generation body design, the 2016 MacBook Pros also debut a new processor architecture based on Intel's Skylake CPUs, the chip designer's sixth generation Core processor. A primary feature of the new chip design is its ability to rapidly power down when computationally idle. The 15 inch model has two base configurations: the first ($2399) using a 2.6 GHz quad-core Intel Core i7 Skylake (6700HQ) with 6MB shared L3 cache (customizable to a 2.9 GHz Core i7 6920HQ with 8MB shared L3 cache for $300 more), and the second ($2799) being a 2.7 GHz quad-core Intel Core i7 Skylake (6820HQ) with 8MB shared L3 cache (customizable to a 2.9 GHz Core i7 6920HQ with 8MB shared L3 cache for $200 more). We tested the base version of the latter (a 2.7 GHz Core i7 6820HQ). Geekbench 4 benchmarking returned a single core score of 4295 and a multiple core score of 13296. Note that unlike iOS mobile devices, the architecture and interface of macOS makes it easier to benefit from multiple threads on multiple cores, more of the time. Note that despite not having had a major CPU upgrade since 2013, Apple's Mac Pro with 8 or 12 core Xeon processors remain 55-72 percent faster in multiple core benchmarks, while Apple's year-old 27 inch 5K iMac with a desktop quad core Core i7 scores about 25 percent faster. That means users with an insatiable need for processing power should consider Apple's non-mobile offerings. At the same time, mobile users can't exactly complain that their super thin MacBook Pro is marginally slower at peak tasks than a desktop class machine plugged into the power main. The latest MacBook Pro scores are in line with the highest end, custom configured MacBook Pros previously available: last summer's models using "best" tier Intel's Crystalwell Core i7 CPUs that Apple offered. So rather than being a major leap in processor power, the latest MacBook Pro delivers similar performance to premium chips at a lower base price, in a lighter, thinner enclosure. The new MacBook Pro is half a pound lighter than previously, so being able to deliver that slim package with similar performance to the high end--but at a lower base cost —is a pretty impressive engineering achievement. Once a perpetual driver of faster processing every year, Intel's x86 architecture appears to be stuck in computational stasis. 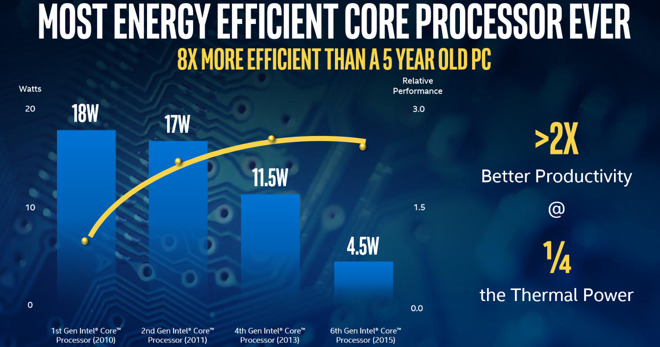 In part, that's intentional, as Intel focuses both on alternatives to raw speed (including the battery efficiency that's so important in mobile machines, as highlighted in Intel's graphic below) as well as alternative ways to achieve performance (including faster bus designs, support for faster RAM and superior external interfaces), all of which contribute to better performance in ways that a blazing fast CPU engine on its own can't equal. After all, it doesn't matter how fast your processor is running if you're struggling to get data in and out of the system. Apple has also been working to enhance multiple core CPU support in macOS, taking fuller advantage of the four core architecture of the Core i7. Apple representatives noted that Skylake's support for quad-core CPUs was a primary reason for selecting that Intel architecture over the newer Kaby Lake microarchitecture, which doesn't yet offer any four core versions. The same issue of Intel failing to deliver a quad core version of is newest microarchitecture kept Apple from adopting Intel's newest Broadwell processors last year, and using Haswell chips instead. Kaby Lake can also support more than 16GB of RAM, but currently requires the use of less power efficient RAM than the MacBook Pros were designed to use. So moving to Kaby Lake to get more RAM would not only involve lower battery life, but would also lower high end performance, maxing out with dual core CPUs. Apple has been criticized for the engineering decisions it made in the newest MacBook Pros, but that criticism seems to be largely uninformed; those complaining about 16GB not being "pro enough" seem to have failed to catch the whole story. Another major objective for Apple over the last few years has been to delegate more processing tasks to the GPU. That effort has increased with the appearance of Metal on macOS. Metal originated on iOS, where it was intended to slash the CPU overhead required to set up tasks for the GPU, whether graphical, or simply math optimized for calculation on a GPU core. On the Mac, Metal also helps to keep the GPU busy with less effort from the CPU, freeing general processing processor cores to do other tasks. The benefits of the Metal architecture are harder to present in benchmarks, because most graphics benchmarks seek to fully saturate the GPU without regard for how busy the CPU is. Ideally, both the CPU and GPU are otherwise idle while running graphics benchmarks, but running benchmarks that way also buries the core intent of Metal. In real world scenarios, OpenGL typically can't fully exploit the GPU because the CPU feeding it is too busy itself with OpenGL overhead and other non-graphical tasks. Developers, however, report that using Metal does help enormously by enabling them to more efficiently schedule more graphics operations on the GPU without bottlenecking the CPU. That allows games, for example, to assign more non-graphical operations such as physics calculations to the CPU while the GPU runs closer to being fully utilized. The new MacBook Pro pairs the basic Intel HD Graphics 530 (on Intel's CPU package) with a dedicated AMD Radeon Pro 450 or 455 GPU with 2GB of its own RAM. There's also a $100 option for an AMD Radeon Pro 460 paired with 4GB of GDDR5 memory, which Apple noted was a first in any notebook. 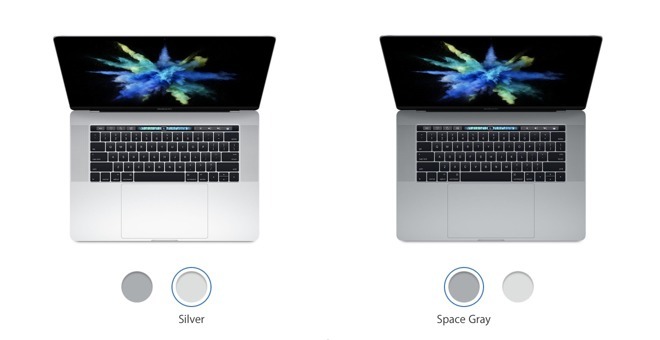 Note that it's a $200 option on the lower end version of the 15 inch MacBook Pro. Like previous models, macOS can automatically activate and switch to the dedicated GPU when necessary and fall back to integrated graphics to save energy. Apple states that the discreet Radeon Pro graphics on this generation MacBook Pro is up to 130 percent faster in 3D graphics over the previous models. Along with enhanced utilization of the GPU, another key performance bottleneck Apple has taken aim at is hard drive storage. Conventional hard drives use a spinning magnetic platter, which has long been cost effective but has a series of downsides in a notebook: they're large, they generate heat, they're potentially susceptible to impact shock and they're much slower than solid state storage drives (SSD) using flash memory chips. MacBook Pros put their SSD storage directly on the PCIe bus, enabling them to be materially faster than PC alternatives that use SATA interfaces. Apple has also fully adopted Intel's Thunderbolt 3 architecture for exposing the high speed PCIe to external peripherals. Thunderbolt 3 supports up to 40 Gbps file transfers, in addition to multiplexing DisplayPort signaling. Further, Apple uses the same USB-C connector for Thunderbolt 3 and and for USB 3.1 peripherals, as well as for power input. 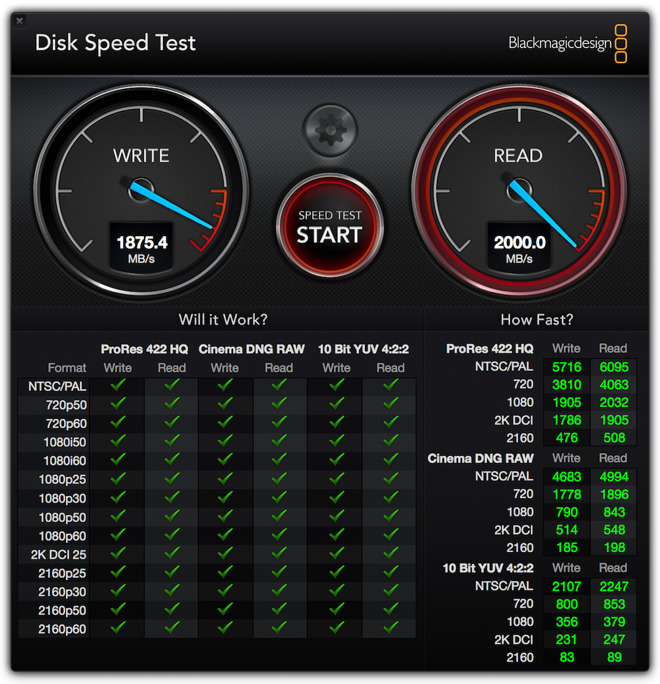 I connected an external 3TB USB 3.0 mechanical hard drive, and using the Blackmagic Disk Speed Test app (which uses noise data to simulate real video transfers), I got 70 MBps (560 Mbps) write and 19.1 MBps (153 Mbps) read results. The upper limit for USB 3 is 480 Mbps. The upper limit for USB 3.1 is 5 Gbps. The System Information panel listed the connected external drive as being on the USB 3.1 Bus (I purchased it as a USB 3.0 device). In comparison, the same drive barely scored 23 MBps (184 Mbps) write and 14.1 MBps (113 Mbps) read results on a MacBook Air using standard USB 2.0. That highlights how much difference the connection technology makes, in addition to the overall speed of the system. Thunderbolt 3 has an upper limit of 20 Gbps per channel on two separate buses. I did not have a Thunderbolt 3 storage system to test. However, the internal 512GB SSD, like Thunderbolt, uses PCIe, the fastest bus on the machine, without any intermediary protocol such as SATA to slow things down. It is very fast, scoring 1875.4 MBps (15,000 Mbps) in writes and consistently maxing out the benchmark app at its upper limit of 2,000 MBps (16,000 Mbps or 15 Gbps) for reads. That's really fast. Apple outlines SSD sequential read speeds up to 3.1 GBps and sequential write speeds of 2.2 GBps, which is up to 50 percent faster than the previous generation of MacBook Pros. You can also now configure 2TB of SSD storage, although it's a very expensive option. Moving from the base 15-inch model's 256GB SSD costs $200 to get to 500 GB, $600 to upgrade to 1TB and $1400 to get to a 2TB SSD. The "better" 15-inch model starts with a 512GB SSD, and costs $400 to get to 1TB and $1,200 to reach 2TB. Other PC vendors offer cheaper SSD options, but those are lower performance SATA III drives, an option Apple doesn't offer on its MacBook Pros. Other PCIe SSD components are priced similar to Apple (and are relatively hard to find, as the budget-oriented PC world sticks with SATA for cost savings). It remains to be seen what impact the upcoming Apple File System APFS will have on disk performance. Currently still in beta, the modern new file system for macOS and Apple's other platforms promises to be "optimized for Flash/SSD storage and feature strong encryption, copy-on-write metadata, space sharing, cloning for files and directories, snapshots, fast directory sizing, atomic safe-save primitives, and improved file system fundamentals." By standardizing on the ultrafast PCIe bus for its SSD options, Apple has the ability to optimize its file system software in ways that other platform vendors and their non-integrated partners can't. On top of being light, thin and fast, this year's new MacBook Pro also improves its audiovisual specifications, adopting an improved, Wide Color Retina Display and a redesigned audio system with louder, broader sound along with three mics for improving FaceTime chats and Siri voice recognition. Apple first introduced support for the DCI P3 Wide Color gamut on its iPad Pro this summer, then expanded support to its newest iPhone 7. Like both of those introductions, the new MacBook Pro retains the same pixel resolution (2880x1800) but improves its brightness by two-thirds (arriving at 500 nits, which Apple attributes to brighter LED illumination, an optimized light guide panel and a larger pixel aperture) as well as increasing contrast by an identical two-thirds, resulting in deeper blacks and brighter whites. The new support for Wide Color also means the screen shows the full color spectrum captured by iPhone 7's cameras. The DPI P3 gamut presents 25 percent more colors. The enhanced color gamut specification was developed for digital cinema, so it's not just your personal photographs that will be able to take advantage of its support for Wide Color. Once you get used to a Wide Color display, it's hard to go back. Additionally, the new screen is 30 percent more power efficient. The new body design of the MacBook Pro also makes room for larger speakers. Apple says they create louder sound with twice the dynamic range, and that the positioning creates a greater stereo separation. I initially noticed this, but before I could do much testing, the review machine I used stopped producing sound entirely. However before that occurred I was actually surprised by the Mail delivery sound appearing to slide across my keyboard and fly into the ether. The sound quality is impressively crisp; Apple notes that the tweeters are pointed right at your face from both sides of the keyboard. The lower frequency woofers emit sound through the sides of the unit, reflecting from the surface you have it sitting on. That means if you have it balanced on your lap, the sound can lose some of its depth. On a desk, the sound is immersive, wide, clear and impressively substantial, particularly given the thin outline of the machine. The big MacBook Pro audio upgrade is a really important new feature, and comes in tandem with larger, louder sound from Apple's other big 2016 releases, including the iPad Pro and iPhone 7: Wide Color, Wide Sound! Two of the most obvious visual differences of the new MacBook Pros, once you open it up, are the huge new trackpad and the ultra low profile keyboard. The trackpad represents the second generation of Force Touch on the MacBook Pro. The first version of Force Touch was the same size as previous trackpads, necessitated by the fact that it was installed into the shell designed for the original, mechanical trackpad. The clicking mechanism is gone, replaced (similar to the iPhone 7 Home Button) with a virtual click delivered by a vibration actuator behind it. It feels very real, like a perfectly balanced button that's just too big to be so precise if it were an actual button surface rather than an Force Touch panel. Because the new design is no longer constrained by the physics of a hinged button that depresses inward, it can be large. Apple made it huge: twice as big as the previous 15 inch MacBook Pro. The point? It's easier to click, drag and perform other gestures, even when starting from the middle of the trackpad. And while macOS hasn't introduced any new multitouch gestures specifically for the new trackpad, some of those existing ones make more sense now that the trackpad is so large. For example, a three or four finger + thumb pinch is easier to use to reveal the Desktop or to bring up the home page of apps on Launchpad. You can also more naturally swipe in from the right side with two fingers to reveal Notifications and widgets. Additionally, used in combination with buttons or other controls in the Touch Bar, you can comfortably make selections across the much larger trackpad while picking different options about using your opposite hand. The new MacBook Pro keyboard is the second version of Apple's "butterfly" mechanism first introduced on the Retina MacBook. It's improved, but there's still very little travel in the keys. When I first started typing, I found it felt both foreign and flat and seemed to be louder when typing (in comparison with my MacBook Air). After some typing, the keys quickly began to feel more familiar, although the tapping sound of the keyboard continues to be somewhat distracting. On a MacBook Air —or the company's other conventional "scissor" design key switches —hitting individual keys is closer to silent, but the key caps themselves seem to jiggle around a bit as you type. This less precise design of the Air keyboard also results in more light leakage around the keys. The previous MacBook Air keyboard leaks more illumination around the keycaps. There are subjective advantages to both, but I soon found the new keyboard comfortable to type on; moving back to a different keyboard now results in the earlier designs feeling foreign. The new MacBook Pro keyboard is thinner and flatter, and individual keys don't feel like floating plastic caps; they feel closer to tapping on a membrane. Keys are also closer together with less blank space between them. Having spent some time typing, I can now say I like the new keyboard design. It also serves an important contribution to the new machine's remarkable thinness and portability. Further, the new keyboard also closely integrates into the Touch Bar. Moving back to a non-Touch Bar machine feels particularly archaic, like a step back into the distant past. It's worth noting that if the keys were any more substantial and had a greater throw of movement, the hard, flat Touch Bar would feel less integrated. Currently, the perfectly flat Touch Bar feels a bit dead when you tap it after having banged at the physical keys for a while. There's no haptic feedback, so it's the same as moving from a physical keyboard to tapping on an iPad screen. The new keyboard therefore fits into a middle ground between a deeper keyboard throw and a totally flat experience like that of typing on the glass of an iPad. 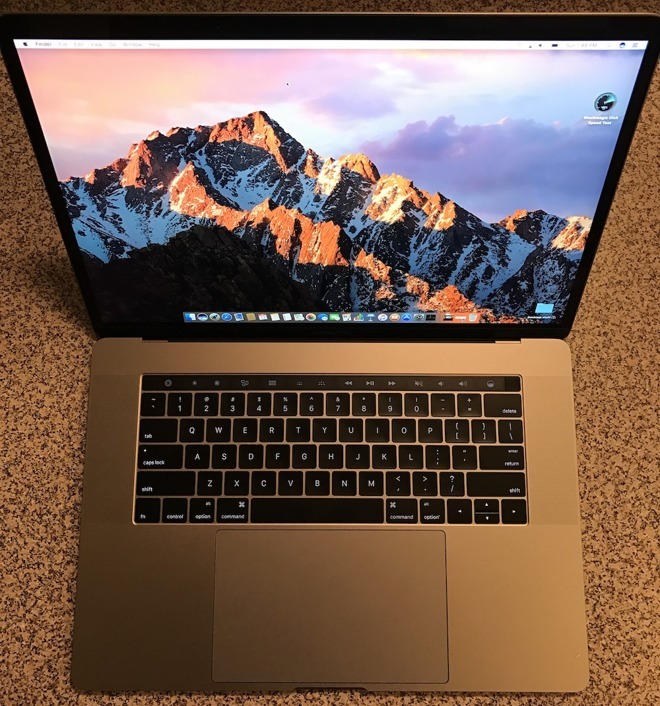 It's as thin as an Air and feels not much heavier, but packs all the Pro features Mac users are accustomed to at the higher end: desktop class performance, broad expansion connectivity and super fast, larger capacity internal storage. The new model also delivers a huge, spectacular Retina Display; great built-in sound and a large, accurate trackpad. The new keyboard is a reflection of its thinness, and paired with whizzy new Touch Bar and Touch ID, the new machine delivers a satisfying, futuristic experience and is just fun to use. It remains to be see how extensively third party developers will take specialized, functional advantage of the Touch Bar in their apps. However, even in apps that make no special use of the Touch Bar, Apple's design exposes common Control Strip features and Siri, and presents word and emoji suggestions as you type, making the new strip useful regardless. What could have been better? If you're looking for an iMac-class machine that folds up and can be carried off site, there's two problems standing in the way. Apple doesn't make thick heavy laptops anymore, clearly because there wasn't that much interest in machines the size and weight of 17-inch MacBook Pros. But secondly, Intel doesn't even make the chips to power fast, quad core machines with vast amounts of RAM, even if Apple wanted to build a small batch of thick machines that didn't have very good battery life. Given that reality, it's hard to criticize the design decisions behind the new MacBook Pro. Its CPU is not much faster than previous models, but that's largely because of equally important, parallel priorities of Intel, which is also aware of what kinds of features and form factors sell best. Power efficiency, light weight, a thin design and fast connectivity are all preferable in the market to simple clock speeds. Along those same lines, while there's been criticism of Apple ditching old port types and even its own MagSafe, the wholesale move to one plug for everything is really better for users overall, individuals who have divergent needs. It would not be better for the new MacBook Pro to be saddled with old connectors for USB-A and Thunderbolt 2 / Display Port. In fact, the edge walls of the new system are slimmer than the shell of an USB-A port itself (below, Apple's $9 USB-C to USB-A adapter). Not having to visually line up the direction of a USB port is so much nicer than the original USB type plug, and the fact that a simple adapter might be needed in the transition —one that costs less than $10, or can be solved with the use of a USB-C hub, really leaves this a problem without an issue. The new MacBook Pros also now have more flexible USB-C power adapters (below, which can now be used to also rapidly power your iPhone, iPad or any other device rather than being solely useable as a MacBook charger). They can be charged from either side, or draw power from a display or dock or power bank designed for USB-C devices, including solar panels like the Solartab C and other common external battery packs. The four ports all serve as both USB 3.1 ports and as high performance Thunderbolt 3 interfaces, and can support massive resolution external displays. A 5K display packs over 2.5 times as many pixels as even the built-in Retina Display, and thanks to Thunderbolt 3, this machine can power two of them. It can also drive four 4K screens. You'll need to be careful about selecting cables, as the physically identical USB-C used by USB 3 and Thunderbolt 3 has different requirements for cabling related to the speed and power a given cable can support (just the same as a given Category of Ethernet cabling). 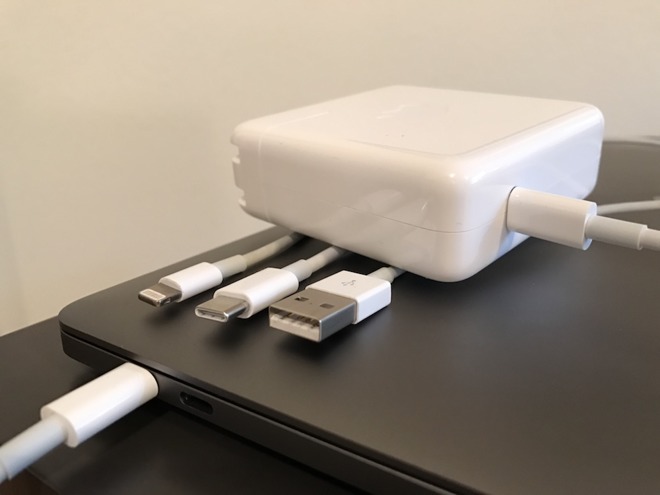 However, the super flexible, uniform "everything on one connector" design of Thunderbolt 3 is clearly the future of cabling high performance peripherals, displays and external storage units. You'll most certainly need a new cable adapter for some of your existing devices, including your iPhone. Several low cost USB docks, some sporting an SD Card reader, should adequately handle most user's backward compatibility needs. One last issue that has gained lots of attention is that these MacBook Pro models and their upgrades are not cheap. Apple's typically premium pricing is nothing new, but as PC prices plummet and buyers begin to eye lower cost computing solutions--including Apple's own iPad Pro offerings —Apple's remaining holdout as the notebook maker that sells significant volumes of machines well above $1,000 has everyone wishing that these machines were easier to afford. 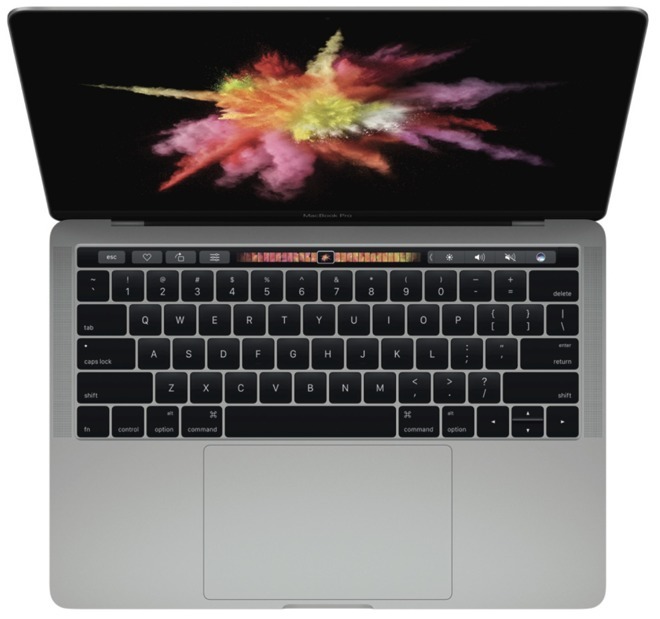 Apple's 15-inch MacBook Pro with Touch Bar asks a steep price, but also delivers an incredible balance of power and efficiency, with industry leading support for technologies like PCIe SSD storage, Thunderbolt 3 connectivity and OS-integrated support for Wide Color gamut imaging. The Touch Bar —along with Touch ID —offers new conveniences and exposes features in new ways, allowing an innovative style of immediate, iOS-like interaction on conventional notebooks. These MacBook Pros weigh in at $2,400 to $2,700 before adding premium upgrades such as a high capacity SSD or faster CPU and GPU, luxury prices that take your breath away. However, by all accounts it appears Apple knows its audience and will have no problem selling significant volumes of these high end machines. Underneath its premium flagship, Apple has a number of lower priced options ranging from the entry MacBook Pro lacking a Touch Bar, to the even more mobile but less capable Retina MacBook to the now entry level non-Retina MacBook Air, and more economy priced iPad and iPad Pro offerings. On the other hand, some professional and prosumer users with needs for more RAM and processing power than this super thin notebook can deliver are either going to wait for future Intel components to arrive or invest in desktop machines —although both Apple's iMac and Mac Pro models are currently hanging in the wind without recent processor bumps and lacking any roadmap for some of the new technologies introduced on the latest MacBook Pros, including Thunderbolt 3. But still: this light, thin powerhouse with an iOS-inspired touch interface panel, fast Touch ID fingerprint authentication and an incredibly fast architecture and connectivity options will spark excitement among those who can afford to pay Apple prices for Apple designed gear. Before purchasing your new MacBook, make sure to check out AppleInsider's Price Guides to find the lowest prices available for your desired configuration and see which Apple authorized resellers currently have your desired model in stock. As of press time, new orders for these new MacBook Pros with Touch Bar are backlogged by 4 to 5 weeks through Apple's direct and indirect sales channels. Therefore, deals and discounting on the Touch Bar models have yet to kick off in Apple's reseller channel. Still, most shoppers can still save hundreds on their new MacBook Pro with Touch Bar by pre-ordering from an Apple authorized reseller who does not collect sales tax on orders shipped to most states. You can easily tack on an AppleCare extended protection plan to these MacBooks for the discounted rate of $299 ($50 off) by selecting the AppleCare option immediately after you press the "Add to Cart" button on B&H's website. Or just use this link.